LTL was one of a number of architects and designers selected to participate in the creation of the single largest private development in American history: the MGM CityCenter in Las Vegas. 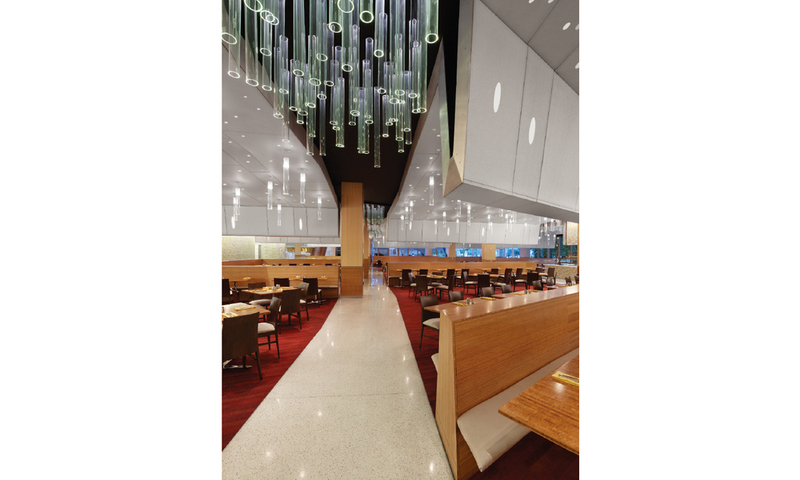 LTL’s assigned challenge was to rethink the Las Vegas buffet by enhancing the dining experience and facilitating social interaction while maintaining the performance standards of the 600-seat all-you-can-eat venue. At the heart of the problem was a tension between the need to break the 23,600-square-foot dining floor into smaller, more intimate seating areas and the desire to preserve a clear line of sight across the entire space, leading all customers to the food stations and providing a view to the pool landscape beyond. A sculpted, white, cloud-like ceiling drops down to align with the high points of the banquettes, creating a sense of a private dining room for the seated yet framing a clear view corridor through the buffet for customers moving through the space.